Distribution is the final stage in the delivery of RF signals from antennas. 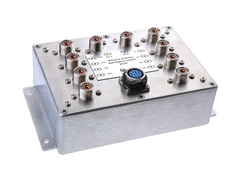 It carries received signals from multiple receive antennas and arrays to the multiple individual receivers, operating on different (and the same) bands. The purpose of distribution system is to allow any receiver to use any antenna on any band, at any time, indenendently of other receivers and absence of any kind of influence. Distribution system splits received signals with the use of wide band splitters, multiplexers and remore relay switches. At each operating position received signal can be futher filtered and amplfied by individual preamplifiers. Distribution system is the heart of the receive antennas for any serious SO2R, Multi-Single, Multi/2 and Multi-Multi stations,and for DX pedition with few operationg positions.